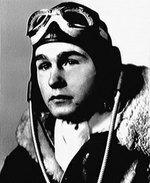 ww2dbaseGeorge Herbert Walker Bush was born at 173 Adams Street in Milton, Massachusetts, United States. His family moved to Greenwich, Connecticut when he was still young. He graduated from Phillips Academy in Jun 1942, the same month he turned 18 years of age, and immediately joined the US Navy. After completing a 10-month program, he was commissioned as an ensign with the US Naval Reserve and became a pilot. In Sep 1943, he was assigned to torpedo bomber squadron VT-51 as a photographic officer. In the spring of 1944, he was assigned to light carrier San Jacinto, participating in the Mariana Islands campaign, though he missed the Battle of the Philippine Sea due to losing his aircraft after an emergency landing in the water immediately after takeoff. On 25 Jul 1944, Bush shared the credit of sinking a Japanese cargo ship off Palau. On 1 Aug, he was promoted to the rank of lieutenant (jg). ww2dbaseOn 2 Sep, Bush flew an Avenger aircraft and attacked Japanese facilities on the island of Chichi Jima. Encountering heavy anti-aircraft fire, his aircraft was hit and his engine caught on fire. He struggled to complete his mission by dropping the bomb over the target, flew a few miles away from Chichi Jima, and bailed out of the aircraft. 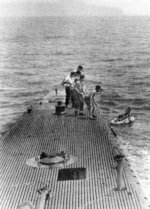 Both of his crew members were killed in action; he was rescued by submarine Finback after four hours of floating in his inflated raft. 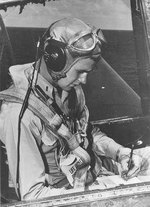 For his efforts to complete his bombing mission despite of his aircraft being seriously damaged and aflame, he was awarded the Distinguished Flying Cross. ww2dbaseBush returned to San Jacinto in Nov 1944 after serving a month aboard Finback. He flew missions in support of the American invasion of the Philippines. ww2dbaseBush returned to the United States at the end of 1944. He flew 58 combat missions during his front line duty. For the remainder of the Pacific War, he served at Norfolk Navy Base in Norfolk, Virginia first as a torpedo bomber instructor then as the commander of torpedo bomber squadron VT-153. He was honorably discharged in Sep 1945 after Japan's surrender. ww2dbaseBush married Barbara Pierce in Dec 1944 and entered Yale University after the war. He graduated from Yale in 1948 with a degree in economics and worked with Dresser Industries in the oil exploration business. He entered politics in the 1950s, and ran for the position of Senator for the state of Texas in 1964, but lost the election. In 1966, he was elected to the House of Representatives wing of the US Congress. Between 1971 and 1973, he was the United States' Ambassador to the United Nations. In 1974, he was appointed by President Gerald Ford, a fellow WW2 US Navy veteran, as the Chief of the US Liaison Office of Communist China, a position somewhat equivalent to an ambassador although the US officially did not recognize Communist China at the time. In 1976, he became the director of the Central Intelligence Agency. In 1984 and 1988, Bush was twice the Vice President of the United States under President Ronald Reagan. In 1988, he was elected to the White House and became the 41st President of the United States. During his presidency, he oversaw the invasion of Panama in Dec 1989 and the first Gulf War of 1990-1991. Bush was also known as a proponent of the improvement of US-Russian relations in the post-Cold War era. Economically, he also was a key player in the initial talks that eventually led to the signing of the North American Free Trade Agreement (NAFTA) in 1993 (after Bush left office). ww2dbaseBush suffered from vascular parkinsonism, a form of Parkinson's disease that had forced him to use a motorized scooter or wheelchair since at least 2012. He passed away at his home in Houston, Texas, United States. He was the 12th US President to lay in state in the Rotunda of the US Capitol building. 12 Jun 1924 George Bush was born in Milton, Massachusetts, United States. 9 Jun 1943 George Bush was commissioned as an ensign in the US Naval Reserve at Corpus Christi, Texas, United States. 25 Jul 1944 George Bush shared the credit for sinking of a Japanese cargo ship off the Palau Islands. 1 Aug 1944 George Bush was promoted to the rank of lieutenant (jg). 6 Jan 1945 George Bush married Barbara Pierce. 3 Jan 1967 George Bush became a member of the US House of Representatives. 3 Jan 1971 George Bush stepped down as a member of the US House of Representatives. 1 Mar 1971 George Bush was made the US Ambassador to the United Nations. 18 Jan 1973 George Bush stepped down as the US Ambassador to the United Nations. 19 Jan 1973 George Bush became the Chairman of the Republican National Committee, a position within his political party. 16 Sep 1974 George Bush stepped down as the Chairman of the Republican National Committee, a position within his political party. 26 Sep 1974 George Bush was made the Chief of the US Liaison Office to Communist China. 7 Dec 1975 George Bush stepped down as the Chief of the US Liaison Office to Communist China. 30 Jan 1976 George Bush was made the US Director of Central Intelligence. 20 Jan 1977 George Bush stepped down as the US Director of Central Intelligence. 20 Jan 1981 George Bush became the Vice President of the United States under President Ronald Reagan. 20 Jan 1989 George Bush became the 41st President of the United States. 2 Jan 1993 George Bush stepped down as the President of the United States. 30 Nov 2018 George Bush passed away at his home in Houston, Texas, United States. 3 Dec 2018 George Bush became the 12th US President to lay in state in the Rotunda of the US Capitol building. This liberal Democrat says that the senior Bush, George Herbert Walker Bush, is a great American hero who has earned a place in every American heart. The fact that his son is not an especially good president does in no way diminish the greatness of Liutenant(jg)Bush.